Fethiye on the Mediterranean coast of Turkey is surprisingly adorable even though it is jam packed with British expats and tourists. 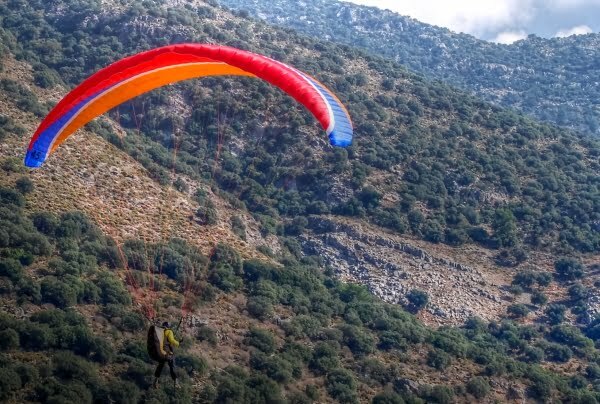 They obviously have good reasons to visit Fethiye in the thousands and a British newspaper called The Guardian named it as a top tourist spot in the world. Especially people looking for discount rates while savouring the amenities of all inclusive holidays may consider the region an excellent option for the next spontaneous getaway. 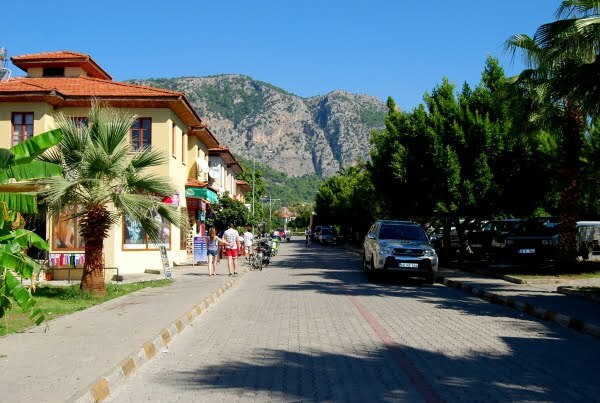 Fethiye is actually a large region comprising of a number of smaller resorts including Olu Deniz, Calis Beach, Hisaronu, Kayakoy, and even smaller delectable places that are considered off the beaten track. I did not spend enough time in the area so the region still appears at the top of my bucket list. If you have already been, I am sure you will agree with my statement that everyone should visit. However if you need persuading, read on and I guarantee that by the end of the article, the idea will be firmly implanted in your mind. Turkey has many naturally beautiful landmarks in the Fethiye region and I think the Mediterranean coast is so much prettier than the Aegean. 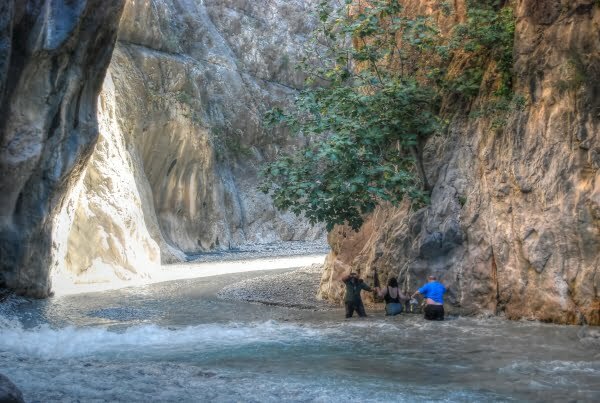 Places like Saklikent Gorge in the photo below win my admiration. 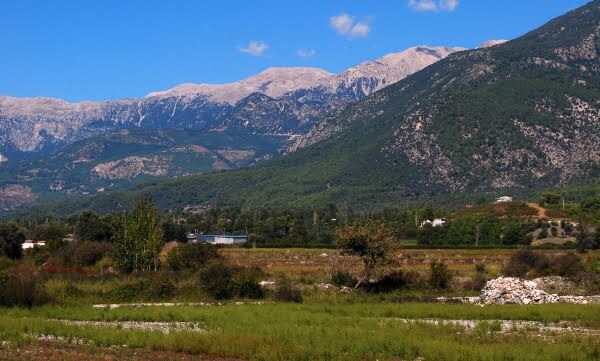 The whole stretch of coastline has terrific historical sites and a less well known attraction is Tlos that is a short drive from Fethiye and massively underrated. 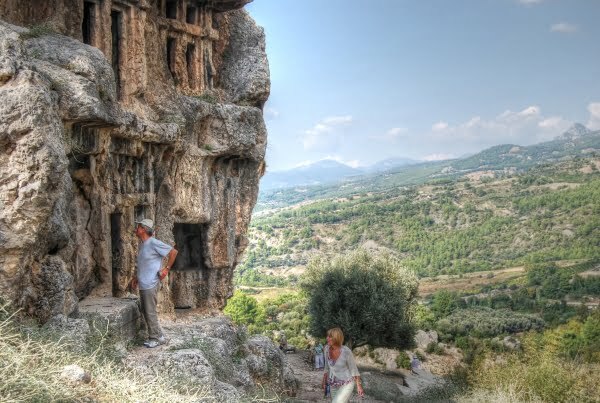 The Lycian rock tombs perched high in the rocks should get more local and international press. I love finding chill out spots to relax with a cold beer and people watch. After all, who can fault a view like this? 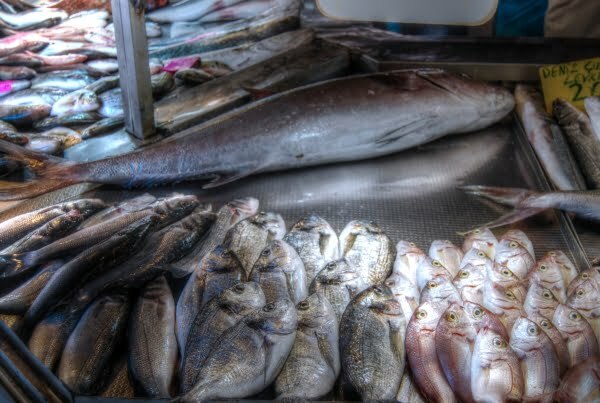 In the centre of Fethiye, there is a small fish market with a marvellous concept and I was eager to visit it because I simply picked my fish, took it to one of the traditional restaurants surrounding the market and they cooked it for me, served with salad and chips. 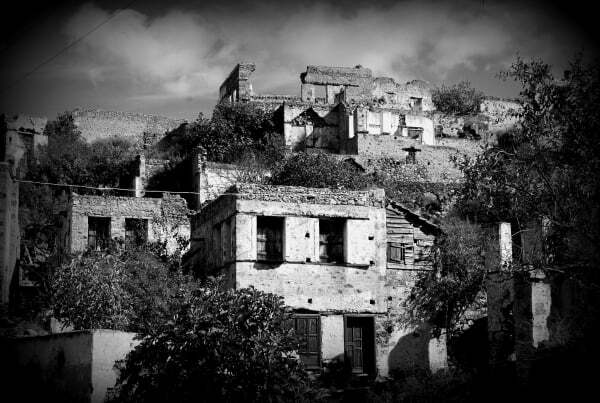 The ghost village of Kayakoy is a big attraction of the region. Previously occupied by Greeks and Turks, it is now a UNESCO friendship village. Read about my visit here. Anyone who knows Turkey will also testify that in some coastal resorts, hassle is a big problem. It makes tourists feel uncomfortable and is intimidating. The shopkeepers in Fethiye though were friendly, professional and I do not think hassle is in their vocabulary. I loved browsing through the wide range of shops scattered throughout the region. 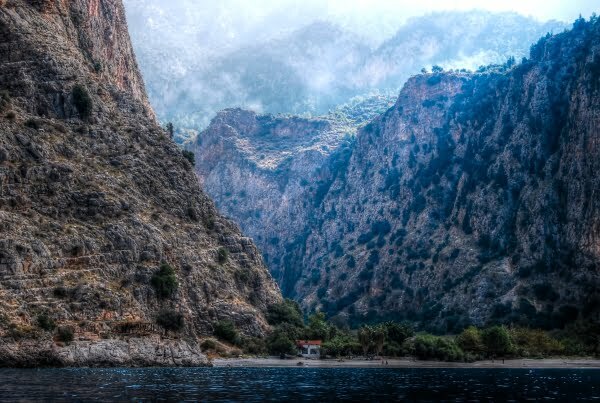 One of my favourite places is Butterfly Valley. 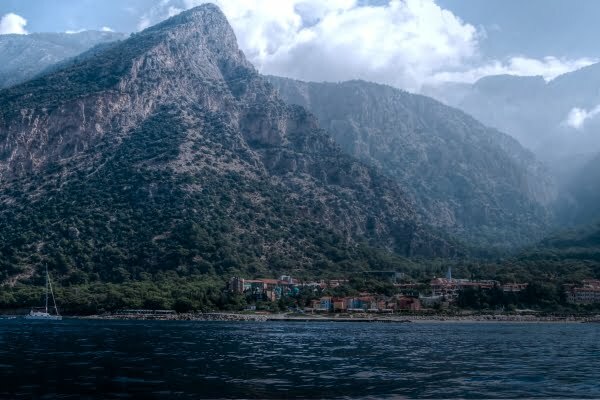 I caught the water taxi from Olu Deniz and spent the day there. This hippie-like destination will blow your mind and you can read more about my visit here. 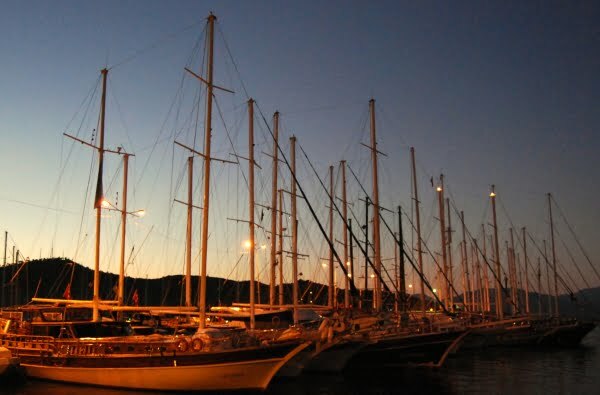 My hotel was near the marina in Fethiye and I soon relaxed into a routine of sitting in the harbour restaurants at sunset. Everything happens in this area and during the day, boat trips depart from there to sail around the coastline. The neighbouring resort of Gocek is close by and I thought it was pretentious however many other people recommend it. Read about my visit here. 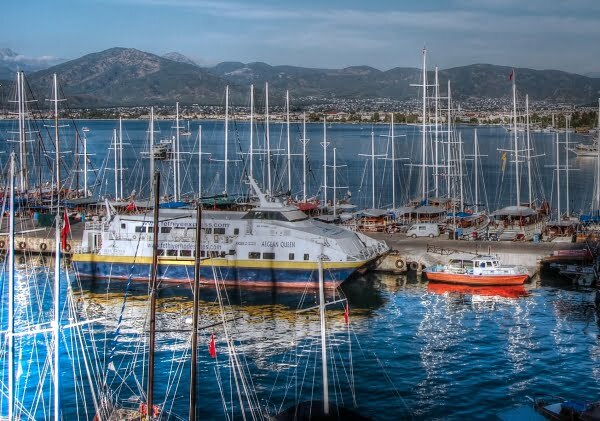 Gulet cruising is big business in Fethiye and most boat captains have extensive knowledge of all destinations on the Turkish Riviera. 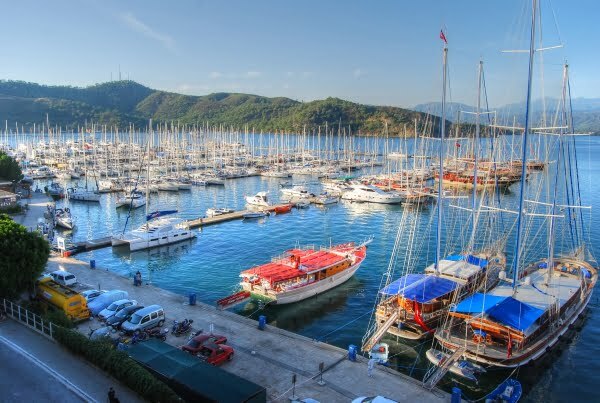 I watched as some luxurious gulet boats docked in but unfortunately I have not won the lottery yet so a four-day cruise from Fethiye is still on my bucket list. I like researching the extensive history of Turkey and was extremely impressed by the museum in Fethiye town centre. They have an extensive range of artefacts and all displays are accompanied with English signs. Unique establishments with interesting layout and décor, instantly grab my attention. Although Fethiye town centre is big, little gems like this are still tucked away down the back streets. Olu Deniz beach is clean, not crowded and for beach lovers, a marvellous place to hang out. The other option is to head there in the morning and jump on board a boat to cruise small bays. The whole coastline is full of intriguing sites like this of which I never explored because I ran out of time. 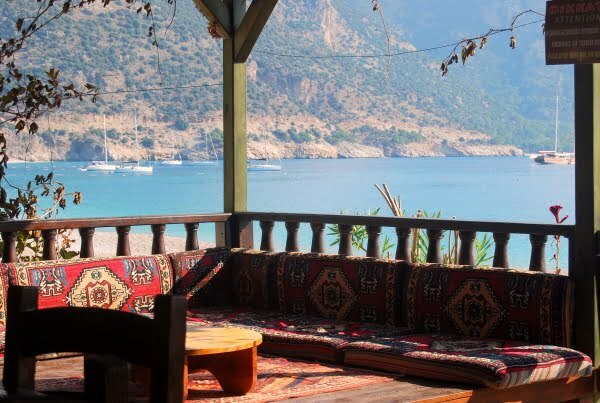 Small villages that are off the beaten track like Faralya, Kabak and Uzunyurt are still on my bucket list. 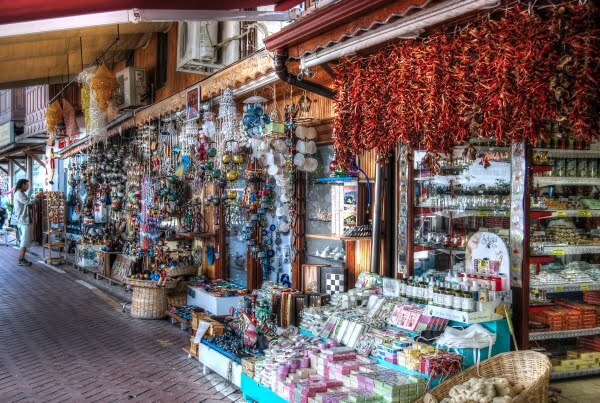 The old town of Fethiye had some impressive small shops that I enjoyed browsing through. 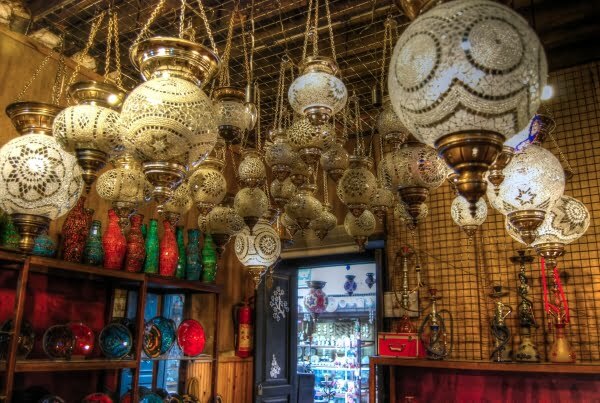 I loved these Ottoman style lamps hanging from the ceiling. Other delights included silver chessboards, ceramics, and homemade art and craft items. 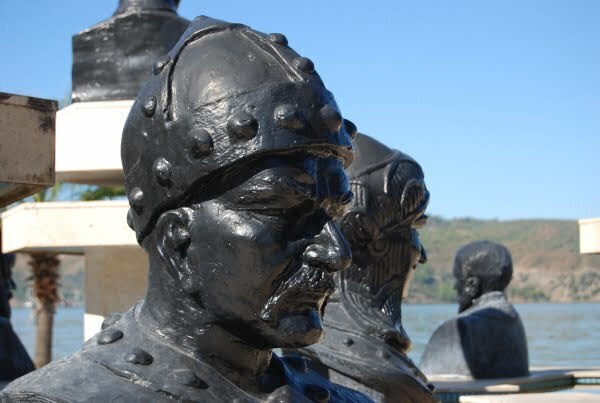 My interest in Fethiye sparked when I spotted these statue heads. My research about who they are is still ongoing but what a fun way to learn about Turkish history! Yakapark is high in the mountains and a popular lunch stop on Jeep safari tours because they have trout farms for customers to pick their own fish for a BBQ lunch. 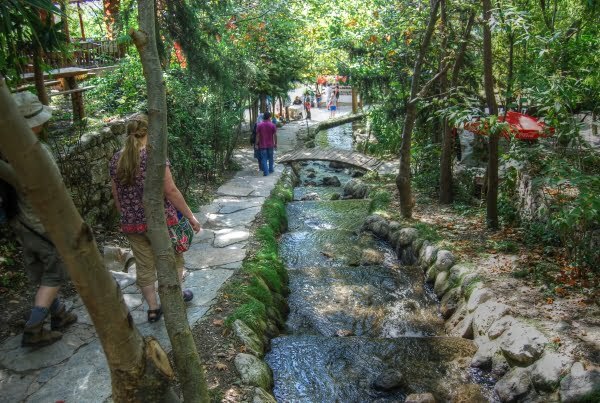 It is a not a luxury establishment, rather basic but it is small places like this, built into the natural landscape that promote great reasons to visit Fethiye in summer. 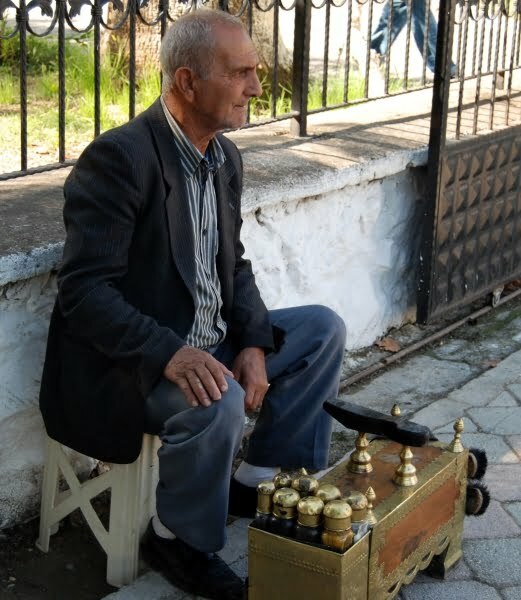 Turkish people are very friendly, welcoming and there is nothing like stopping in the street and having conversations with people like the shoeshine cleaner. Fethiye might be a top-notch holiday destination but you do not need to look far to find the locals and their traditional way of life. When are you coming Ian? Such a mesmerizing place … can’t to finally get to Turkey! 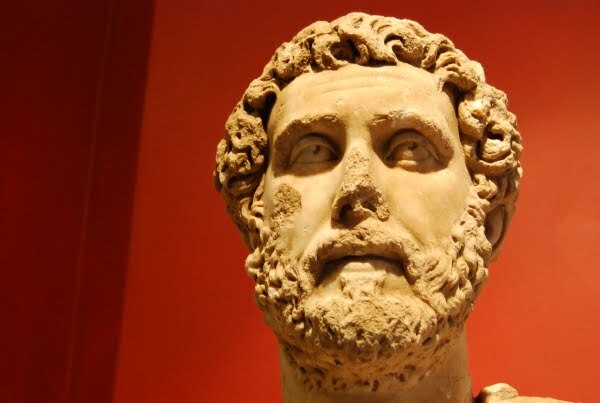 No problem and come back again and again – So much to see and do! Thanks so much to linking back to us. Turkey is such a beautiful place, I’d go again and again! Looks great – love the landscapes. Besides the beach, would love to go on a hike in those hills! Wow! Beautiful and so much to see and do around this region. I can see why the tourists flock there. What a fabulous photo essay! Definitely makes me want to visit Turkey. Thanks Ozlem – hoping to get back there next year for some new photos! So agree with Alan, I am ready to go!! 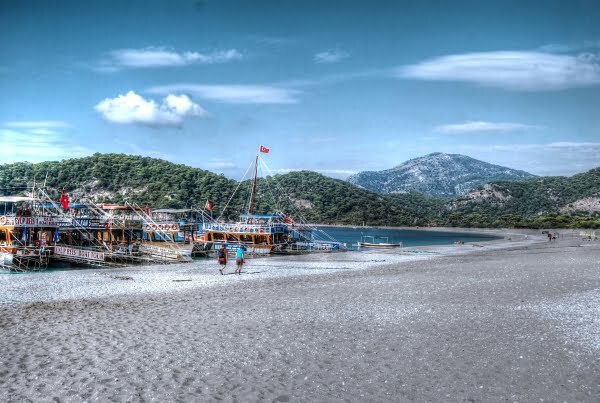 Feast to the eye Natalie, so many reasons to go back to Fethiye; that turquoise sea, history, the landscape and friendly people always a highlight for me – fabulous post! Absolutely amazing post! Your images are breathtaking and incredibly inspiring. I feel as though the beauty of Fethiye has enchanted me and left me with little option but to book a flight!